All the applications/softwares installed in Windows computers store their data at different locations to perform various tasks. It completely depends on the software programmers to save the software data at different locations, as per their requirement. Basically, these locations or directories helps the program to hold different files which are required in program execution or to give output. 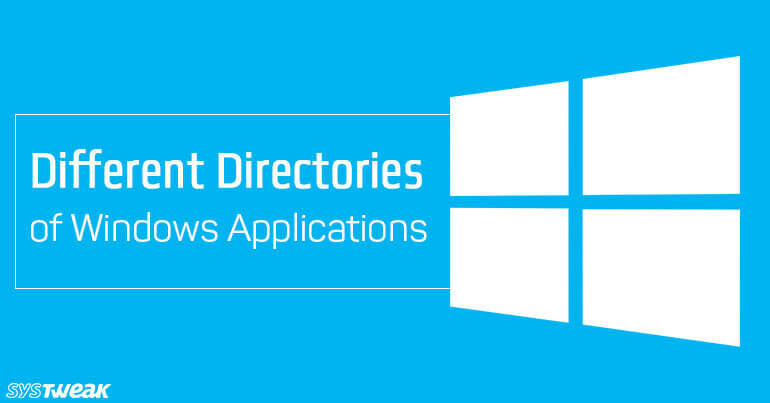 Here in this article we are providing you with the description of different directories which are used by windows applications to store their data. AppData folder is used by different applications to save their important data like settings, logs, updates, etc. It can be accessed at C:\Users\username\AppData\Roaming, here ‘username’ denotes the user account which is currently in use. Each user account has its own AppData folder. Most of the programs installed in our system use AppData as permanent folder to save different files as mentioned above. ProgramData folder is helpful for those applications which is essential for every user accounts such as an antivirus program. Antivirus requires some important files such as database, language package, backup files, etc. to provide complete security to a PC, these files requires a lot of space in hard drive and if ProgramData folder is created individually for all users to save same files, then it will consume much space of system drive. Hence, ProgramData is a unique folder in a system which is accessible to all user accounts. Documents folder is a part of the user account, which is used as a unique location for storing personal documents. Also, different windows based games use Documents folder to save their files because of ease of access. You can easily access documents folder by C:\Users\username\Documents here username denotes the name of user account. Also Read: How To Fix Laptop Freezing Problem? Program Files folder is located in C drive and can be easily accessed by any user. Basically, it is a folder in which all the executive files and their dependencies of all installed programs are saved. You can easily find the folder of every installed application in the Program Files folder. All the applications which you start from their shortcuts are basically run from Program Files folder. Is it important to save the files of these directories? It is not necessary to save the files which are stored in these folders. All the folders hold the data of applications and this data automatically gets deleted once the application is uninstalled and can be recovered once the application is installed. We hope that we are able to enhance your knowledge regarding the directory structure followed in Window. If you have any queries or comments then feel free to post them in the comment box below. August 2017 - Most Hi-Tech Month Of The Year!